There are some managers that should deserve more attention. Claude Puel is one of them. Being coach of Monaco, Lille, Lyon, Nice, Southampton and now Leicester City the native of Castres, land of rugby, has a great football experience, especially after playing for almost 20 years as a player. He is without a doubt one of the best French coaches, but even in his country, he is quite underrated – probably because of his discretion and his calm personality. After 500 games with Monaco as defensive midfielder, Claude Puel came to the manager position in 1999. Winning Ligue 1 in 2000, the team formed with Ludovic Giuly or David Trezeguet does not look like it was and Puel’s contract was not renewed. In 2002, he returned to a Ligue 1 coaching position at LOSC Lille, a position he held until June 2008. During his six seasons in the north of France, he managed to qualify for the Champions League twice, including a historic victory for a French club at the San Siro stadium against the AC Milan team already qualified in 2006 and a knockout game in 2007 against Manchester United. Claude Puel succeeded Alain Perrin and took the reins of Olympique Lyonnais in the summer of 2008. The OL, seven times champion of France consecutively, relied on Puel to cross a new level and finally reach the European summits. After an encouraging start, where Lyonnais were leading the French league and had qualified for the knockout stages of the Champions League, the Lyon team slowly fell. Lyon finally gave up the title, which they had held since 2002 to Girondins de Bordeaux, but qualified for the preliminary round of the Champions League. During the 2009-2010 season, Claude Puel shaped a team according to his wishes, spending € 72,000,000 on the summer mercato by recruiting Lisandro López, Aly Cissokho, Michel Bastos and Bafétimbi Gomis. He also became the first coach in club history to qualify Olympique Lyonnais for the semifinals of the Champions League. In 2012, Claude Puel became the coach of OGC Nice. The 2012-2013 season proved extremely brilliant for the new coach with a fourth place in the league and a qualification in the European Cup that the Nice club had not won in decades. His managerial career in Nice is maybe where he started to develop his own game plan. After a fourth place in the 2015-2016 championship, furthermore with a plaisant gameplay, he left the club in agreement with his leaders to go to Southampton in Premier League. He left a very good team and especially a very developed training centre to Lucien Fabre, who continued in the same direction. Claude Puel is known for his fast and counter attack football build on 4-3-3 or 4-2-3-1 with a classical midfield composed by a centre midfielder (“8 jersey”) a box-to-box and an offensive creative playmaker. In attack he often asks his wingers to cut inside the box to create overloads. Claude Puel tactic. 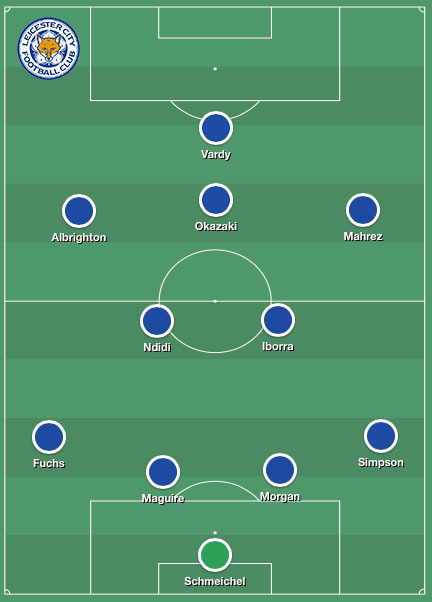 Playing more with 4-2-3-1, and sometimes with two real strikers – Nice(Plea and Germain), Leicester (Vardy and Okazaki). 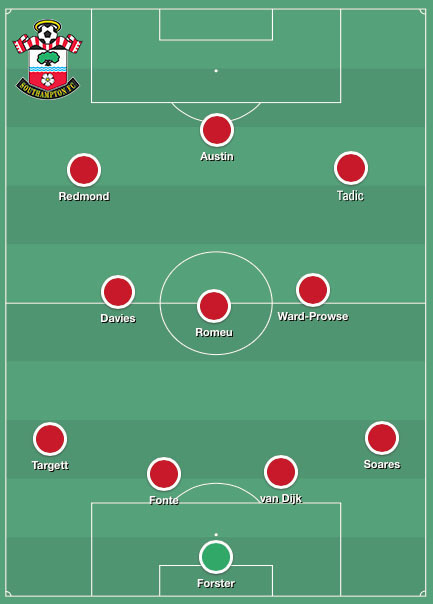 Probably chosen by the board because of his experience and his tactics that fit perfectly to the Southampton squad, he chooses surprisingly to consolidate his defence by often dropping his wingers in the middle, the line-up looking like a 4-5-1 with a low block. This tactics was unable to generate good vertical transitions and needed to play with swiftness and fast counter-attacks. However, for his first year in foreign lands, Puel managed to hoist his team in the final of a cup, after eliminating Liverpool, they finally fail to win against the Red Devils (losing 2-3). Despite a promising first season in eighth place in the Premier League, he was sacked on June 14, 2017. Among the reasons for his dismissal was the elimination in the group stage of the Europa League and a total of points less than the previous season under Ronald Koeman (6th with 63 points, or 17 more) while the French manager had to compose without Sadio Mane, gone to Liverpool, Wanyama (Tottenham) and Pelle (Shandong Luneng). The leaders also evoked the quality of the proposed game and management considered too rigid. 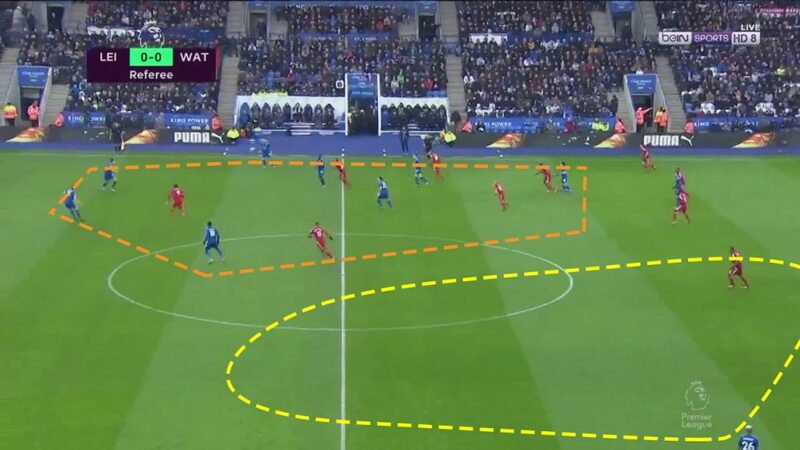 In Leicester, Claude Puel found a team well equipped to play his counter-attack style. The squad has not lost so many players since its title winning season except for its strong midfield with Kante and Drinkwater. However, there are still Mahrez, Vardy or Albrighton and the team has strengthened with the arrival of Ndidi and Iborra in the midfield and Maguire in defense. The last is one of the surprises of this season thanks to incredible stats for a little-known defender : 2 goals and 4 assists. With this squad Claude Puel is able to push excessively his tactic mindset. Built on pace, this tactic is a mix of gegenpressing and kick-and-rush tactics. Creating overloads on one side, to take the ball, and then throw long balls on the other side. This tactic perfectly fit with Leicester attack, especially with Demarai Gray and Riyad Mahrez. Create overload on a side and then pass to the other side to make fast and strong counter-attacks. 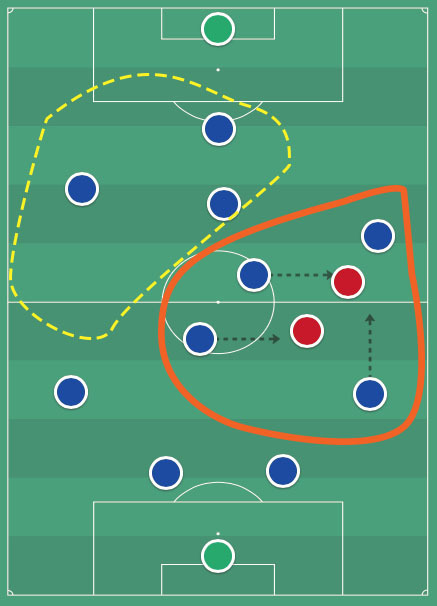 Exemple of this tactic. Note space at the bottom, there is only Mahrez. This pressing remains active only for a short time, then the defense is taking place in a classical way. When the ball is won it is moved quickly to Iborra, who is the substitute to Drinkwater in this role/position. At the time of writing this piece, Leicester are 7th with 34 points. They are just behind top clubs, however it would be difficult to climb a notch above because of the points difference (8 points from Arsenal) and the level, which is too high for this kind of team. Nevertheless, like Burnley (8th with 34 points too), Leicester should stay at this position while teams behind – Everton, Watford, West Ham or Bournemouth – are 8 points apart from the Foxes. Therefore Claude Puel will meet the expectations of the board and supporters, and so he should stay at the position, at least one season more, his contract expiring until 2020.